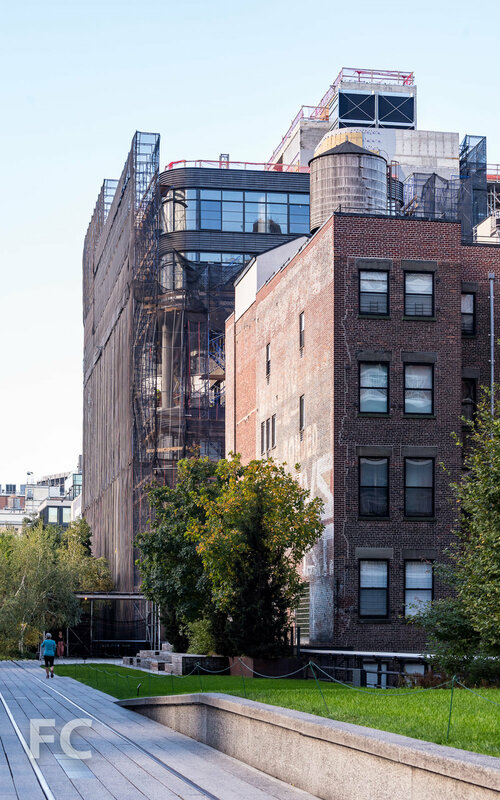 Construction scaffolding is coming down at 512 W 22, a warehouse to office conversion adjacent to the High Line. COOKFOX Architects are leading the design, which replaces the previous 5-story warehouse with an 11-story office tower. The massing features rounded corners and several outdoor spaces created by building setbacks and carved out spaces. To tap into the character of the neighborhood, the exterior façade features industrial sash-inspired windows, and anthracite terracotta, zinc and granite panels. The project is pursuing LEED Gold and construction completion is expected sometime next year. Architect: COOKFOX Architects; Developer: The Albanese Organization; Program: Office; Location: Chelsea, New York, NY; Completion: 2018.